Last week buy signals were issued for BTC, LTC, BAT, XLM and EOS. We will review those prior signals and then look at some newer buy signals. Last week buy signals were issued for BTC, LTC, BAT, XLM, and EOS. New buy signals are available. Last week a trade signal for Bitcoin was announced for an entry at the 3995 target area. The predicted conditions for a buy signal on Bitcoin’s chart was when price broke the 1-hour cloud as well as the 4-hour Kijun Sen. We are trading relatively flat in relation to that entry. Bitcoin is currently trading down -20 bucks from our entry point. The target area was not hit for an entry (above 60) – no trade initiated. The entry was when price broke above the 45-degree angle and the 50% Fibonacci arc. Those conditions were met with an entry target of 0.2032. BAT is currently trading around 11% to 12% higher from our entry. No real changes from the entry point to the current value area – it is almost exactly the same. 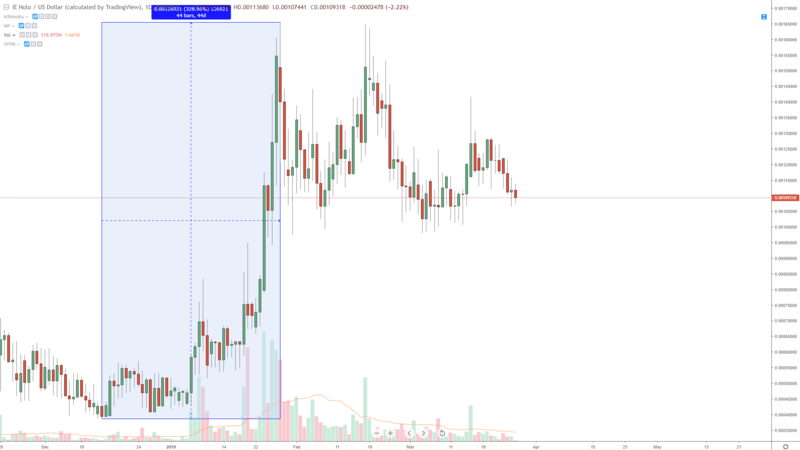 There was some continued selling pressure over the past 5 days but XLM has regained much of that down move. 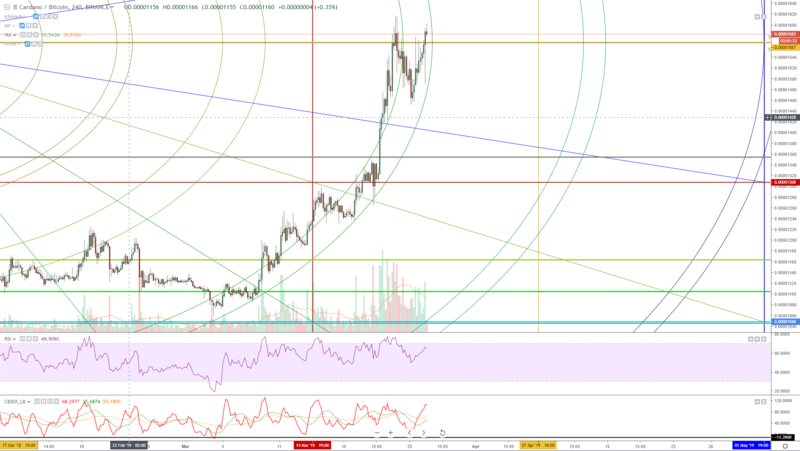 There were two entry targets for EOS; an aggressive entry at 3.69 and a more conservative entry at 4.01. Both of these conditions have been met. 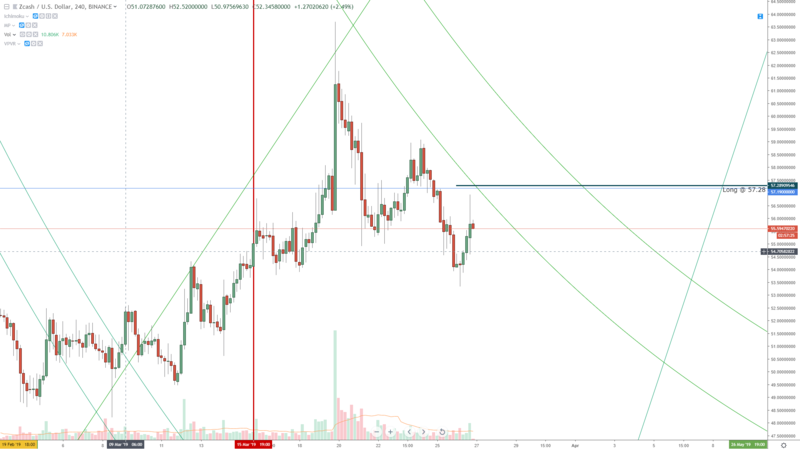 From the aggressive entry at 3.69, EOS has gained as much as 13% since the entry. Cardano is the single largest percentage of my cryptocurrency holdings. I’ve been a Cardano bull since their launch. They have also been an extremely fun and profitable trade. It’s hard to understate how powerful the moves ADA has made over the past couple of months. ADA is currently trading at nearly 8-month highs! That’s amazing given the broader market! ADA was one of the most beaten down and abused cryptocurrencies during the bear market, so it makes sense that there is some drastic recovery. The current level Cardano is trading in is the 1/8th Major Harmonic at 0.00001567. This should hold as an extremely powerful support zone. Entry: Any return near the 0.00001567 value area. Zcash is another very beaten down cryptocurrency. It’s currently the only ‘privacy’ coin offered on Coinbase, but that has not yielded a supportive price action. Currently, ZEC is trading in a bullish continuation pattern called a bull flag. An entry at 57.2989 would put price above the 50% Fibonacci arc and, most importantly, it would break the trend line of the bull flag to see a much larger move higher. The update for the LTC trade from last week yielded a target that was not yet reached. The entry at 61 still appears to be a good zone to tag for a break out above the current congestion as well as a move above the current 45-degree angle. HOT’s chart has been one of the best performing and outperforming cryptocurrencies since December of 2018. In fact, HOT has moved over +328% from the December 2018 lows. That’s a staggering and powerful sustained move. On the current chart, HOT is displaying some very wide distribution and consolidation. A conservative entry above prior trading highs on the daily chart should yield good results. ICX has had some very bullish moves as well. It has mostly been following the aggregate market in its moves. 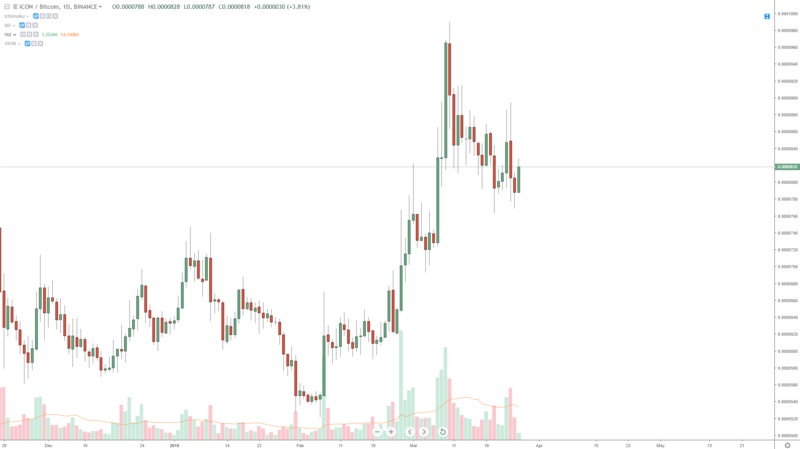 Like many other crypto charts, the ICX chart is displaying a powerful bull flag. An entry above the most recent high would yield the best results. Hi Jonathan, Danny from the CrypoShark group lat year. Been following you since then and really like your analyses. Anything new on ZRX? Doing well, still expecting it to hit 0.55? I definitely am! And how you doin?! Hi Jonathan. Really impressive stuff here. Where did you learn Gann? Why do you think it works? What relationship does it have with Fibonacci? I also saw your article on using RRGs for crypto and all of your signals were spot on. 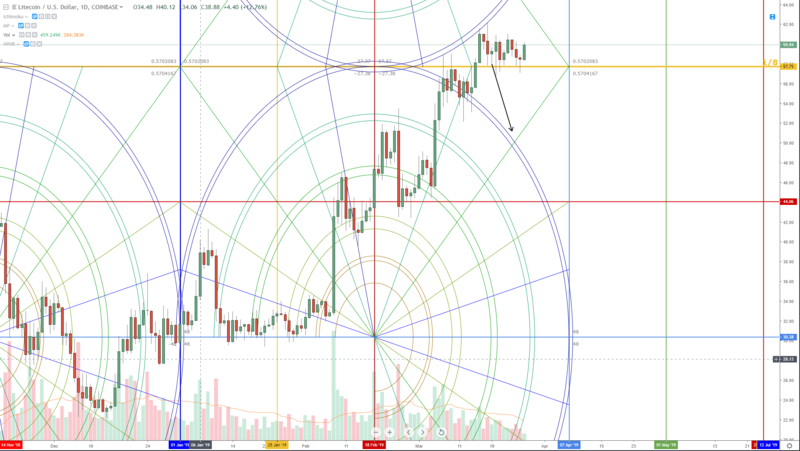 Do you prefer TradingView for Gann or Optimum? Sadly TV doesn’t have RRGs. Do you think Optimum is worth a buy for the crypto RRGs? Do you use it often? Howdy Mike, thank you for your words! Gann has taken me years to learn. Something I’ve learned through my own research and talking with some other Gannyst’s is that we’ve all been ‘self taught’. It’s one of the most personal journies I’ve ever done – and it is the closest thing to finding a discovery like Indiana Jones as I’ll ever get. I believe it works because Gann takes the approach of the market being non-random – that it is a visual representation of a natural phenomenon, which is exciting and sometimes disconcerting. Gann works because it teaches what REALLY causes trend changes: Time. News doesn’t matter – it’s absolutely crazy how non-random not just the markets are – but human behavior and patterns – it’s nuts. Tradingview is my ‘go to’ software because many new analysts and traders have such limited funds and Tradingview is just the best value out there. Honestly, I wish tradingview existed when I started. But Optuma is my go-to platform for my own analysis. It is THE platform for using Gann – it is the best software out there – period. The RRG’s are amazing – I feel like sometimes they are the closest thing to cheating you can get :-D.